The skies cleared over Sag Harbor today as hundreds gathered to celebrate the dedication of the Lance Cpl. Jordan Haerter Veterans Memorial Bridge. Members of Jordan’s unit, recently returned from Iraq, joined his family, friends, townspeople and various organizations to pay tribute to this young American Hero. Various local politicians gave speeches and proclamations were read, but the most moving speeches were those of Jordan’s family and his commander. The weather cooperated with a dry respite from rain during almost all of the ceremony. 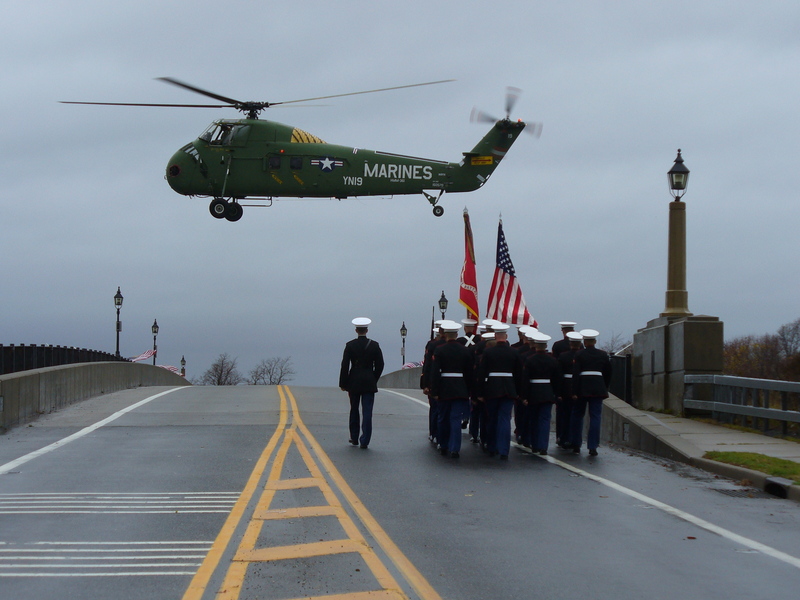 Patriot Guard Riders lined most of the bridge with flags before having to redeploy to the Sag Harbor side when the restored Marine helicopter flew in to hover over the bridge. Earlier the American Legion Post hosted a large breakfast for members of Jordan’s Unit, and afterwards the Sag Harbor Fire Department hosted a ‘Hero’s Luncheon’ which was also heavily attended. The Town went out of its way to make the whole event a great success. Here is a link to pictures from the day. Here is a report from the East Hampton Press with some excellent photos.